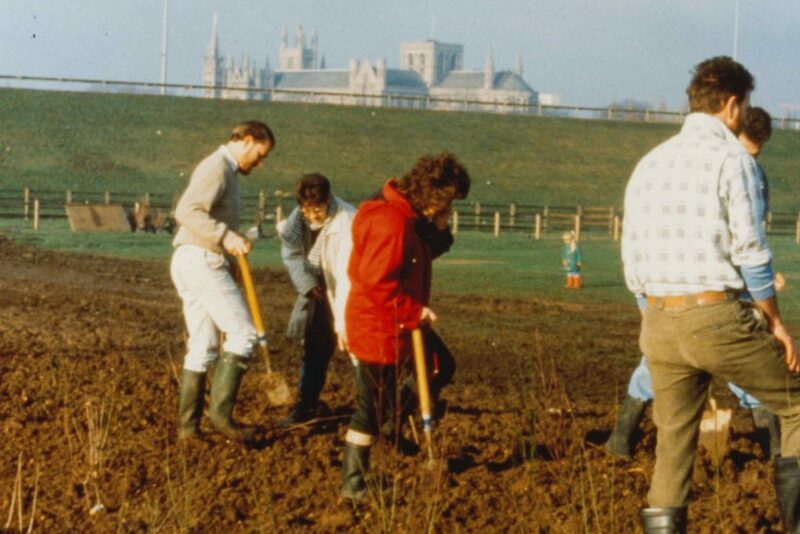 PECT was set up as ‘Peterborough Environment City Trust’ after Peterborough’s designation in 1992 as one of four UK Environment Cities – along with Leeds, Leicester and Middlesbrough – after a nationwide competition run by BT that the city entered back in 1991. Peterborough City Council was heavily involved in this bid and, on being one of the four winning cities, it set up PECT as a charity to house the environmental ambitions for Peterborough. PECT has been an independent charity since 2012, delivering ground-breaking and innovative projects of local, regional and national significance, enabling change for a sustainable future. Greener Futures was PECT’s award-winning, interactive website for primary schools covering environmental and sustainability issues. Greener Futures offered teachers a way to introduce environmental and sustainability issues to their pupils. It helped children develop skills and enabled them to take action to reduce their environmental impact. Over 60 supporter organisations joined the scheme during its first year of operation. The funders for the project were Weetabix, Viridor, and DEFRA. Greener Futures was PECT’s award-winning, interactive website for primary schools covering environmental and sustainability issues. Celebrating its 20th anniversary in 2020, the Peterborough Green Wheel is a 45-mile network of cycle ways, footpaths and bridleways. Designed as part of a sustainable transport system, it was created as a Millennium project for the city. It was named the ‘Green Wheel’ because of the circular path, with cycle route ‘spokes’ leading from the perimeter into the city centre. Not only does the Green Wheel contribute to a sustainable transport system, it also celebrates over 3,000 years of social, cultural and economic history through colourful interpretation boards and a series of sculptures. This £11 million project was 50% funded by the National Lottery through the Millennium Commission, matched by contributions from public and private businesses and voluntary organisations. Celebrating its 20th anniversary in 2020, the Peterborough Green Wheel is a 45-mile network of cycle ways, footpaths and bridleways. PECT Consultancy Ltd was launched as a subsidiary of PECT with the aim of delivering a range of energy related services across the UK. In its first year alone, the organisation provided 1,900 households with loft and cavity insulation, saving over 42,500 tonnes of CO2. 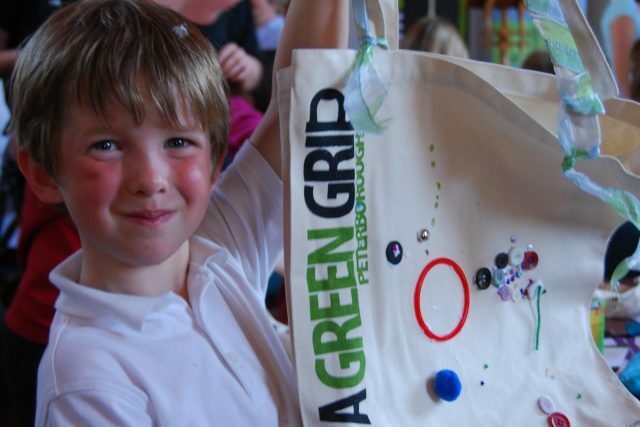 The Get a Green Grip Peterborough campaign was officially launched by PECT in May 2008. The campaign aimed to distribute over 5,000 natural cotton bags for free to enthuse shoppers across the city to replace plastic bags with a reusable cloth bag. The aim was to combat the use of plastic bags, which are used sometimes only once, but can take 1,000 years to decompose. 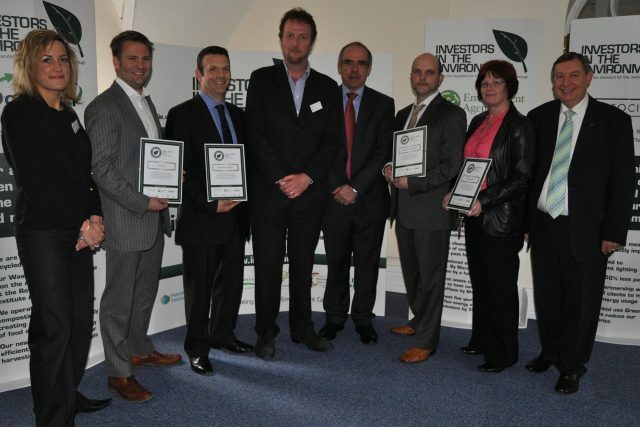 Investors in the Environment (iiE) is a national environmental accreditation scheme. It is designed to help businesses save money, reduce their impact on the environment, and get promoted for their green credentials. We provide tailored support and expert advice to help businesses reduce their impact on the environment. The supporting membership around this accreditation scheme gives businesses the help, promotion and networking they need to make their business greener and to receive recognition for their eco initiatives. Members’ achievements are highlighted at the annual iiE Awards, through case studies and media articles. Commitment is demonstrated with a recognised stamp of accreditation. By ultimately putting together a credible Environmental Management System (EMS), the scheme also allows businesses to keep ahead of emerging environmental legislation, involves staff in securing operational efficiencies, and raises their corporate profile. Creating smarter businesses of the future. Investors in the Environment (iiE) is a national environmental accreditation scheme designed to help businesses save money and reduce their impact on the environment. Greeniversity was a national green skill share initiative that gave people the opportunity to teach and learn everything from bee-keeping to bike maintenance. 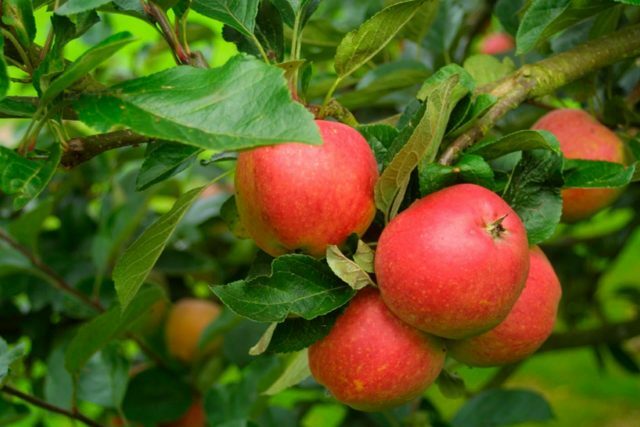 In 2010 PECT launched Forest for Peterborough, an exciting project to plant over 180,000 trees in and around the city and surrounding countryside by 2030. The aim is to plant one tree for every person living in the city. PECT wants to improve tree coverage to create a network of wooded areas, improving our green spaces, the quality of air we breathe, and also making sure that Peterborough is less vulnerable to the effects of flooding and other extreme weather. By the year 2021 over 25,000 new homes will have been built in Peterborough, meaning more built up areas and more people. The tree planting will change the city’s landscape, forming a vital network of wildlife corridors and green spaces, threading their way through our built-up areas. Bringing together communities, schools and businesses for the volunteer planting days means that everyone can get involved with and contribute to improving their natural surroundings. Forest for Peterborough means so much, not only for the quality of life of city residents today, but for future generations of Peterborough citizens. In 20 years’ time your family will enjoy the benefits of the trees planted today, which will be big enough to walk under. In 2010 PECT launched Forest for Peterborough, an exciting project to plant over 180,000 trees in and around the city and surrounding countryside by 2030. Faith in the Environment ran for three years. During this time 200 local people from five different faith groups in Peterborough learnt about climate change and how to reduce their impact on the environment. 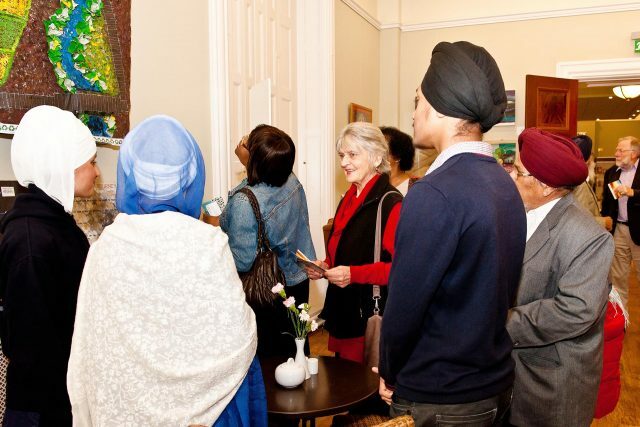 Since 2010, the five faith groups – Hindu, Muslim, Sikh, Christian and Buddhist – took part in a range of interactive, hands-on workshops about the environment. 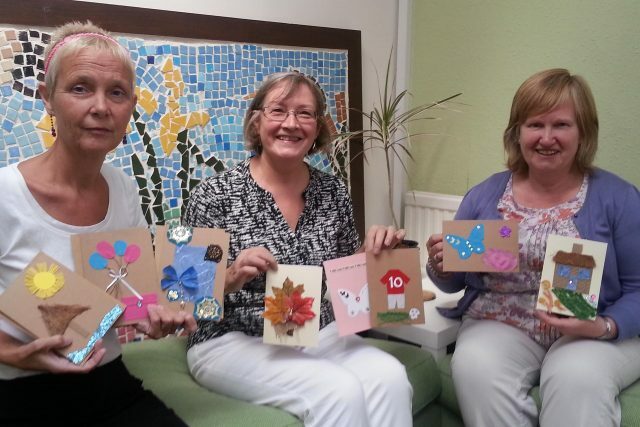 They also attended green events to share eco-friendly tips with other members of their communities, and created art to showcase what they had learnt. The Faith project explored how to reach a diverse range of people with an environmental message and how to get that message passed from person to person within the faith community. PECT’s Love Local was a community engagement project that ran until 2015. It aimed to tackle health inequalities in Peterborough, in particular levels of obesity and associated chronic disease. It did this by addressing barriers to healthy eating through a linked programme of cooking skills and nutrition knowledge. In its final stage, the project worked within two of the most deprived areas of the city where rates of obesity and associated diseases are particularly high. Sessions took place every week across five inner-city hostels, delivering healthy cooking classes to adults who, for a variety of reasons, are homeless, socially isolated or unemployed. Topics discussed during the course included cooking tips and techniques, food safety, smart shopping and budgeting. The sessions taught essential life skills in a relaxed, friendly atmosphere where participants could access free education while growing in ability and confidence. PECT’s Love Local was a community engagement project that ran until 2015. It aimed to tackle health inequalities in Peterborough, in particular levels of obesity and associated chronic disease. Peterborough schools celebrate their green successes at the annual Peterborough Eco Education Awards (PEEAs). In the run-up to the awards, pupils from across the city develop projects to demonstrate their commitment to learning about the environment. This gives schools across the city the chance to showcase their environmental initiatives and demonstrate the fantastic work that they have carried out over the course of the academic year. We worked in collaboration with researchers at the University of Bath to deliver a groundbreaking sustainable living project funded by ESRC and Defra. The results from this innovative project are available here and the findings will inform national policy on environmental behaviour change. The project tests explain the hypothesis that by engaging people at a moment of change, such as moving house, they may be more receptive to interventions and may develop sustainable habits. We completed 800 residential doorstep surveys with 400 new movers and 400 non-movers across areas of Peterborough. PECT worked in collaboration with researchers at the University of Bath to deliver a groundbreaking sustainable living project funded by ESRC and Defra. Announced as part of the government’s Waste Strategy, Peterborough was named as one of six UK cities to trial innovative methods of waste management and reduction as part of the Zero Waste Places scheme. Zero Waste Places aimed to go as far as possible in reducing the environmental impact of waste, whether it be at home, in the workplace or in the community. In Peterborough the project focused on Cathedral Square and the three streets leading from it (Bridge Street, Cowgate and Long Causeway). The first step was to establish where waste was coming from and what the barriers to reducing it were. 160 retailers to were visited to provide advice and practical assistance to help reduce waste and increase recycling, and 75% of the businesses visited agreed to a follow-up visit where an in-depth survey was carried out to establish existing waste management practices and barriers to recycling. The project also worked with Opportunity Peterborough to eliminate as much waste as possible resulting from the redevelopment of Cathedral Square. The contractor, Osborne, demanded construction supplies were delivered in reusable or recyclable packaging and worked with the civil engineers to design out waste. Any unwanted or waste materials were re-homed to local community groups to ensure nothing was sent to landfill. It has been a busy 20 years and we’ve loved seeing Peterborough grow and flourish. We have worked with extraordinary people from Peterborough’s communities, schools and businesses to make simple changes to our way of life that will result in a more self-sufficient city, making us healthier, happier and more prosperous. Over the years we’ve developed Peterborough’s Green Wheel with 45 miles of cycle route across the city, helped businesses save over £3m by becoming more efficient with resources, planted over 40,000 new trees, insulated 25,000 lofts and cavities and worked with 92% of local schools to support the delivery of environmental education, and to help schools reduce their carbon footprint. We’ve run campaigns to get people opting for reusable bags, HRH Prince Charles backed our scheme to give energy advice to thousands of local people, and we’ve run projects that have been adopted as a national blue-print to help residents live more sustainably. All this has been possible thanks to the support and help we have received from local people, businesses, schools, and the strong local network of environmental organisations. Over two sunny weeks in June 2013, 10 schools took part in a project to make a film celebrating the Eco Education work going on in Peterborough. They represent a small fraction of the schools who are involved in Eco Education in the city but they give you a good idea of the high quality and variety of work taking place. We need to say a big thank you to all the pupils and teachers who helped make the film and to Jenna Hiley for agreeing to be the presenter. We also need to say a massive thank you to Paul Spence and his amazing team for the filming, editing, sound, graphics and general brilliance in putting the film together. In 2015 PECT teamed up with Peterborough City Council and the Environment Agency to work on an exciting river improvement programme in Peterborough. The Werrington Brook Improvement Programme aims to holistically improve a sub-catchment of the River Welland during a 5-7 year partnership programme of community-focused works. The plans include physical works to a series of brooks that flow into the River Welland, focusing on Marholm Brook, Werrington Brook, Cuckoo’s Hollow and their interaction with Brook Drain and Paston Brook. The programme takes an all-inclusive approach to creating a healthy river environment that can benefit everyone living, working in or visiting the areas. The partnership aims to make the brooks physically more resilient, tackle sources of pollution and enable community involvement in helping to sustain river improvements. 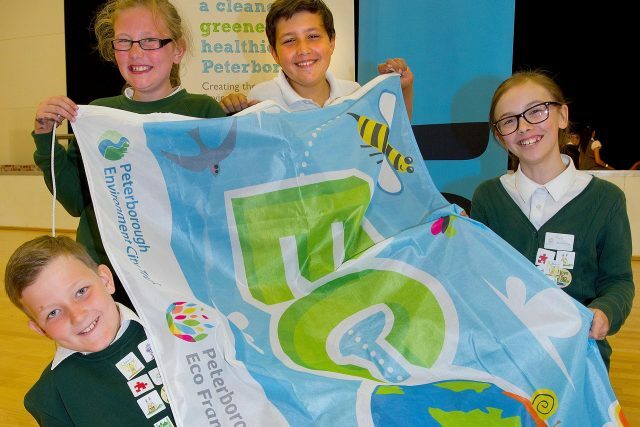 PECT is leading the way nationally with its bespoke Eco Framework for Peterborough schools – embedding knowledge of sustainability issues into classes to inspire the next generation of forward-thinking students. The framework allows schools to show their progress towards becoming Sustainable Schools and their contribution towards enabling Peterborough to become the UK’s Environment Capital. As part of the new framework, schools can gain accreditation in each of the 10 themes. Certificates are awarded for each theme, and when a school has achieved five themes they can proudly fly the flag. The 2015 Green Festival included a fantastic arts element in order to showcase sustainability issues in innovative and engaging ways, supported by funding from the Arts Council. Led by the poet Keely Mills, and commissioned by the Green Festival to create a body of work that was interactive, thoughtful and discussed the Festival’s theme of sustainable transport, a number of poems have been produced on the topic of Peterborough’s bus journeys. Keely became the unofficial poet in residence for all bus routes in Peterborough. Since March this year, and alongside six other poets, she has travelled on the main routes of the city, producing poetry based on the buses that serve the city every day of the year. Keely also commissioned a further six poets to create a poem on the subject, so there are many different versions of what buses mean to people – whether that is a love story, animals as buses or the heavenly tea bar serving hot tea! Over two recording sessions both the poets and performers (including bus passengers, enthusiasts and other artists) came in and recorded the poems, meaning that there are lots of voices represented in the podcast. The podcast will be played at numerous venues over the Green Festival week including the city market, Rivergate shopping centre, Serpentine Green shopping centre, radio stations and also in the Queensgate footbridge. Thank you to the wonderful producers at ‘Beat This’, the community music group in the city, and their expertise. Also a huge thanks to everyone involved with the project: the team at PECT, the team at Stagecoach, Creative Peterborough, Peterborough Presents, Beat This and all the incredible poets: Leanne Moden, Alex Tyler, Pete Cox, Viv Foster, Alun Williams and Charley Genever. Plus a huge thanks to our voices: Judita, Mihail, Armin, Vikki, Carol, Bumper, Brendan, Kitty, Sally and Louise. Nene Coppicing and Crafts is a voluntary group, dedicated to promoting woodland skills, conservation and traditional crafts. The project grew out of PECT’s Heritage Lottery funded project called Woodland Heritage in Action. The group’s main areas of focus are woodlands in Bretton and Castor Hanglands. The woodland management days are designed to improve the health of ancient woodlands and maintain biodiversity, whilst also encouraging people to take up traditional skills. The project also runs conservation sessions, where the focus is on coppicing in the winter months and the majority of surveying and maintenance is carried out in the summer. In addition, event days occur on a monthly basis to engage people in traditional woodland based activities. Nene Coppicing & Crafts also produces a wide range of hand-crafted and locally produced items throughout the year, including ethically-produced charcoal, firewood, and beautiful furniture and decorative items to support the initiative. Nene Coppicing and Crafts is a voluntary group, dedicated to promoting woodland skills, conservation and traditional crafts. Fantastic evidence of local organisations and communities achieving great results by coming together in partnership can be seen at Hampton Court, in Westwood. The hard work resulted in a community café and garden opening its doors in April 2017. The project was brought to fruition by a team of passionate residents and volunteers and supported by local organisations such as PECT and Cross Keys Homes. The café and garden is part of a major investment project led by WestRaven Big Local, the community organisation that represents the residents of Westwood and Ravensthorpe. The organisation received a £1 million grant from the Big Lottery Fund to help make improvements in the area. Big Local seeks to empower people who live in the area to build on local talents and aspirations so they can help make their neighbourhood an even better place to live, both now and for years to come. In 2006 we founded our subsidiary company PECT Consultancy Ltd, which in 2017 become Green Energy Switch. Green Energy Switch is a profit for purpose company, specialising in working with communities, utility companies, and social landlords. Any profits made are gift aided to PECT, making the organisation an ethical choice for your energy management solutions. Green Energy Switch delivers a range of energy related services across the UK, and its key areas of operation include: Voids Scheme, Home Energy Visits, and Energy Performance Certificates (EPC). Visit www.greenenergyswitch.co.uk for more information. In summer 2017, Donald Trump may have pulled the US out of the Paris climate agreement but in Peterborough organisations, individuals, and communities came together to show that understanding and caring for the environment is vitally important. In 2017, PECT’s Green Festival took on a new life as ‘Planet B’. It encompassed a two-week programme of events, performances, film screenings, workshops, commissioned artworks, and a conference – all around encouraging discussion and debate on sustainability. PECT worked alongside arts organisation Metal and community garden The Green Backyard, with funding from Arts Council England. 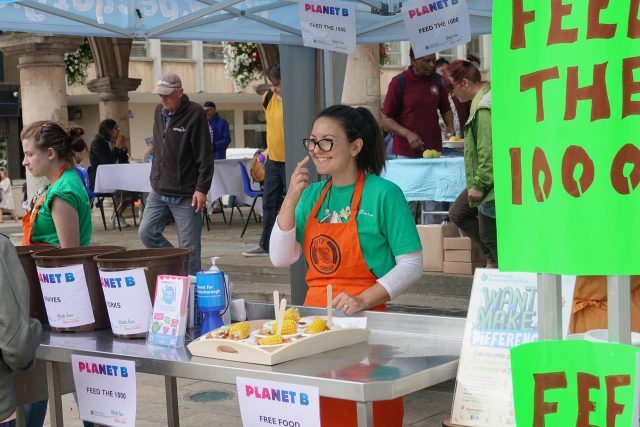 In 2017, PECT’s Green Festival took on a new life as ‘Planet B’. It encompassed a two-week programme of events, performances, film screenings, workshops, commissioned artworks, and a conference. In October 2017, Forest for Peterborough reached a massive milestone when its 100,000th tree was planted within the city’s Central Park. 2018 marks the year when the PECT turns 25! We’ve worked in Peterborough and beyond for a quarter of a century to encourage environmental action and to bring about change. Keep an eye on our website for the full programme of PECT25 events and activities, to be announced shortly. We hope you’ll join with us and continue to support us to make 2018 the year when we achieve our biggest impact yet!